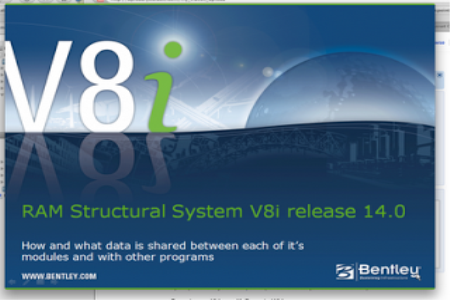 Сейчас вы просматриваете новость Bentley RAM Structural System V8i v14.06.01.00 :February.10,2014, данная новость входит в категорию Софт в которой вы сможете найти все по теме данного материала. The RAM Structural System is a specialized engineering software tool for the complete analysis, design, and drafting of both steel and concrete buildings. It optimizes workflows through the creation of a single model by providing specialized design functions for buildings and by providing thorough documentation. RAM Structural System allows for the analysis and design of a building using a single model. The entire structure can be modeled, including decks, slabs, slab edges and openings, beams, columns, walls, braces, spread and continuous footings, and pile caps. This full structural model increases designer confidence and creates an efficient environment when dealing with changes. The RAM Structural System increases productivity by performing the tedious and time-consuming functions specific to the design of a building such as calculation of live load reductions and lateral load calculations for wind and seismic. In addition, designs are optimized for both concrete and steel. Your competitive advantage is realized with the thorough documentation. RAM Structural System automatically provides steel material takeoffs and detailed and summary reports of design calculations and drawings. And for BIM, RAM Structural System offers bidirectional integration with CADstudio and Bentley’s Structural Modeler, Structural Documentation Center and Autodesk's Revit Structure. RAM Concept lets structural engineers model, analyze, and design virtually any cast-in-place geometry, no matter how complex. Efficiency and quality control are realized through the advanced analysis and design tools for reinforced and post-tensioned concrete slabs and mats. Integration allows for analysis and design of a multi-story concrete structure therefore streamlining workflows.